1 How Does a Hygrometer Work? 5 What is a Hygrometer App and How Does it Work? Having a distorted level of humidity in your home, room or building has a profound impact on your health. It also interferes with the storage of your possessions. Whether you desire to monitor levels to protect your home, animals or possessions, you need the best digital hygrometer to measure the relative humidity. In this article, we are going to teach you what the best digital hygrometer is plus give you a list of the top choices on the market. A hygrometer is a device that measures the humidity in the air. Sometimes they are referred to as a humidity gauge or humidity meter. Most hygrometers work by measuring the pressure changes or by calculating temperatures. A digital hygrometer provides instant and electronic measurements for us. Previous versions of hygrometers required a good amount of work to use. With a digital hygrometer, there is no work required to get your measurements. In previous times, you were required to do a good amount of fiddling with wet cloths and thermometers in order to get an accurate reading. Most hygrometers measure the resistance of capacity of the air and then calculate the humidity from this measurement. With a capacitive hygrometer, the two metal plates inside have air between them. The more moisture there is, the more effect is placed on the capacitance. Knowing how much of a charge there is, the hygrometer can tell the humidity level accurately and quickly. With a relative sensor hygrometer, there is electricity flowing through ceramic material that is exposed to the air. As the humidity rises, water vapour condenses thereby changing the resistance. By measuring the current flowing through the material, the hygrometer gives an accurate humidity measurement. Your comfort level has very little to do with the temperature of your home but is more likely due to the humidity. That’s because comfort is dependent on the rate of moisture evaporation from our bodies. On a humid day, we are uncomfortable because there is so much moisture that our evaporation happens slows. When the air is dry, evaporation happens quickly and we feel cooler. That’s why during the cool, winter months, we feel cold. The air is dry and our body has rapid evaporation. Having a hygrometer helps you to measure the indoor humidity levels so that you can remain comfortable. It’s also important to prevent condensation, mould, mildew and musty odours. A hygrometer will read the indoor humidity of whatever room you have it in. Keep in mind that this will not have any relation to the outdoor humidity. Every homeowner is wise to own a hygrometer to measure the relative humidity (RH) and temperature. You’ll want the relative humidity levels to be between 40-50% for maximum comfort and ideal health. During winter, you might need it lower than 40% to keep the condensation from the windows. Maintaining a relative humidity below 50% is also essential to avoiding mould, mildew and bacteria growth. A digital hygrometer can be used for a variety of purposes other than just for the home. You’ll often find them in industrial premises for the comfort of the employees and protection of the goods. In addition, they are often found in greenhouses where relative humidity needs to be ideal for growing. You can also find specialised hygrometers for food storage areas that will keep your goods moisture-free. Those who have cigar humidors and wine cellars also understand the importance of having the best digital hygrometer to protect their investment. We have three of the best digital hygrometers currently on the market for your consideration. We’ve put each through a deep review and written down the best and worst of each so you can make an informed decision about which model is ideal for you. Topping off our list for the best digital hygrometer is this professional digital hygrometer. It monitors your room temperature and humidity levels every second. The home icon shows you where the humidity levels currently stand so you can adjust the indoor atmosphere to protect your possessions and maximise room comfort. It’s a great tool to use with a dehumidifier as it will indicate the change of humidity; showing you that your dehumidifier is working properly. This hygrometer is made from high-grade materials and is quite durable. You’ll take notice of the simple to read display, making it easy for anyone to tell what the conditions of your home are. You can also keep records on the temperature and humidity to go back and see the changes. There are also multiple mounting options available to make it easy to fit into any room. Use the fold-out stand or magnetic backing if you would prefer to hang it. Many people find that the large 4-inch LCD monitor makes it easier to read the humidity and temperature measurements. It also features a large temperature range from -50 °C ~ 70 °C and humidity range from 10% ~ 99%. The touchscreen makes it easy to change the display unit, turn off or on the backlight and set the recording mode. In addition, there are arrow points that indicate the trends of humidity and temperature so you are more aware of what is occurring around you. LARGE SCREEN: 4 inches backlit LCD must make current humidity and temperature be legible even in the dark environment. WIDE RANGE: Temperature range: -58 °F ~ 158°F (-50 °C ~ 70 °C). Humidity range: 10% ~ 99%. TOUCH SCREEN: Change the temperature display unit to °C or °F, turn on or off backlight and set All Time/24hrs mode through touch button on touch screen. While the price is in line with the ThermoPro, there are a couple of additional features with the Otao that make it worth examining closer. Just like the previous option, there is an LED backlight, but this option is activated either by clapping or pressing the snooze button. If it’s on the charger, the backlight will actually remain on. It’s also multi-functional with the ability to display the temperature, humidity, weather forecast, time and the alarm clock function. On top of that, this digital hygrometer is powered in two ways; you can use 3 AAA batteries or the USB cord. The Otao hygrometer will also give you a 12-hour weather prediction. This helps you to prepare for what to wear before stepping out so you can be comfortable in and out of the home. The downside to this version over the last one is that some people felt the readings might be off slightly. While it isn’t by much, they felt that for a little more money, you could get an option that is more accurate. With that said, the ease of seeing the readings was a big plus for most users. In fact, many of them use this as their main alarm clock because of the convenience. 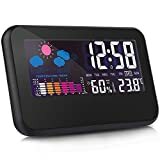 This is the best digital hygrometer for those who like to be able to control their devices from their phones. The sensor on this unit has a 325-foot range with Bluetooth connection. In addition, the sensors are monitored by any number of users at the same time. The SensorPush continually takes readings and is capable of storing data for 20 days. This is nice if you are away from home and want to check the data when you reconnect. The setup of this device is simple and it runs on a CR2477 battery that should last for over a year. 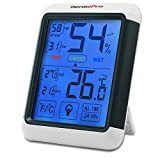 This high-quality hygrometer is the lowest cost option that is also a reliable source for monitoring your home from an app. What many people like about this option is that if there is a problem, the device will also alert you. This gives you the warning you need to act and adjust your humidity levels accordingly. The other upside to this option is that the company allows you to try the product at no risk for two months. That tells us that they are confident you’ll enjoy the device enough to keep it. Obviously, you are going to pay more for this technology and if you want to monitor it from outside the home, you’ll need to purchase the SensorPush router to add on. What is a Hygrometer App and How Does it Work? Aside from these options for the best digital hygrometer, you can now get hygrometer apps for your cell phone. To make this work, your smartphone will need to have a built-in humidity sensor or you can connect one by Bluetooth and USB cable. If you are interested in the outdoor humidity, there are some apps that use your location and the local weather station to send you the humidity measurements. This is just a rough idea though because you might be several kilometres from this location. If you don’t have the best digital hygrometer, there are other ways to measure the humidity. The easiest way is with wet and dry bulb temperatures. A dry-bulb thermometer is your common, household thermometer while a wet-bulb needs to have a moistened piece of cloth or cotton wrapped around the bottom. Simply take two thermometers and shake them to get the mercury down as far as possible. Then, soak your cotton ball in water that is room temperature. Tape this cotton around the bulb of one thermometer. Set this wet-bulb thermometer and the dry-bulb thermometer in the same location. Wait a few hours, or overnight for the best reading. Then, check your temperatures on both thermometers. Write these numbers down. Subtract the temperature from your wet-bulb thermometer from your dry-bulb to get a humidity percentage. For example, if the dry bulb reads 10°C and the wet bulb reads 5°C, you can find a chart online to show you the relative humidity is somewhere around 43%. This works because the dry-bulb thermometer is measuring the temperature of the room. As the wet-bulb’s water evaporates, the temperature drops. The more that evaporated, the cooler it will read. When the air is dry, water will evaporate faster. It’s fun to experiment with this in different rooms and at different times of the year. Now that you see how important it is to have the best digital hygrometer for your home, it’s time for you to decide on what works best for you. Prevent mould, mildew, odours and damage to your home by regulating the humidity with the help of a digital hygrometer and the best dehumidifier. You’ll live comfortably and experience fewer health complaints as well.